The sensitivity of low income households to energy prices and the barriers they face in accessing energy efficiency technologies are well established in Australia and overseas (Walker and Day 2012, ACOSS 2013, Liu and Judd 2016). To this end, NSW and Federal Governments deliver several programs that assist social housing providers, particularly CHPs, to improve the energy efficiency of their housing stock. In NSW, CHPs currently have access to two main funding sources: (1) through low-cost loans arranged by the CEFC’s Community Housing Program for constructing highly efficient new housing, and (2) through the OEH’s HEAP, which co-invests with CHPs to install energy efficiency upgrades to existing community housing stock. These are important resources for CHPs to draw upon. A recent international study surveying Australian CHP Executive Officers found that 80% of them considered improvements in environmental efficiency of their housing stock as a priority (Milligan et al. 2015:40). Despite this prioritisation and the significant funds that are committed to both programs, recent evidence suggests uptake of both programs have been slow and limited to the larger CHPs (OEH pers. comm.). Despite having a broad understanding of the specific barriers present when adopting energy efficient technologies in the rental sector (including split incentives, regulatory and financial barriers) (Instone et al. 2013, Hope and Booth 2014), insights into specific barriers and opportunities for upgrades in the community housing sector are less developed or understood (Urmee et al. 2012). With the 2016 Draft Climate Change Fund Strategic Plan recommending HEAP be extended (such as to include public housing), it is pertinent to examine barriers that social housing providers face in implementing energy efficiency upgrades. International evidence highlights that split incentives – where one party “is responsible for capital costs of an investment, [and] another is responsible for operating costs” (Gillingham and Sweeney 2012:14), and which costs for the latter party may decrease as a result of the former’s capital investment – is a major barrier to energy efficiency in the rental sectors. Gillingham et al. (2009:16) also noted that split incentives may be explained as a principal-agent problem, where the agent (e.g. developer, or landlord) sets the level of energy efficiency of the home and the principal (e.g. tenants) lives with the consequences of the agent’s decisions, such as high energy costs in inefficient homes. International evidence suggests that the principal-agent problem may be responsible for significant portions of energy use in rental properties: “66% of water heating energy use, [and] 48% of space heating energy use” (Murtishaw and Sathaye 2006 in Gillingham et al. 2009:16). 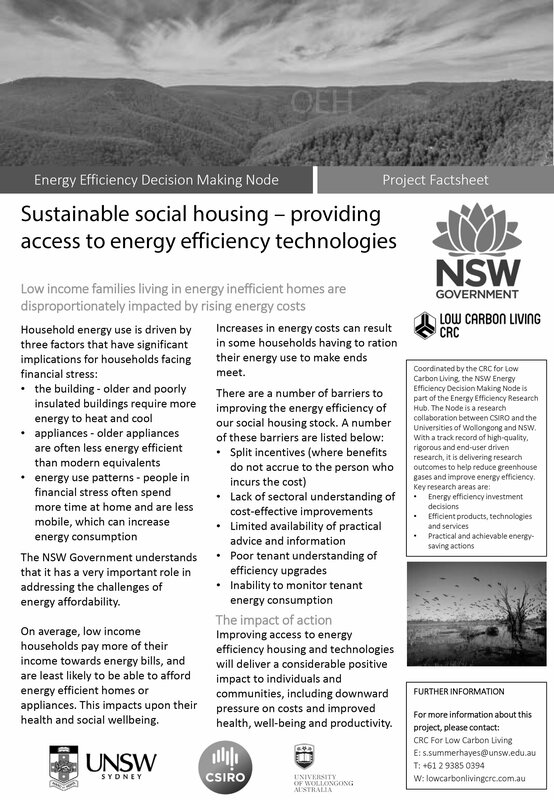 ACOSS (2013) notes that the type of housing that households on low incomes can afford are typically energy inefficient. Adding their inability to afford energy efficient appliances, energy rationing has become part of these households’ daily lives. Australian and international evidence highlights the detrimental impacts energy unaffordability has on households’ health and social wellbeing. Evans et al. (2000), for example, note low quality housing stock directly and indirectly contributes to approximately £2 billion of the United Kingdom’s annual National Health Service spending. Likewise, Liu and Judd (forthcoming) highlight how energy unaffordability has impacted on renters’ ability to afford other essentials such as food and medication as well as significantly impacting their mental health and social wellbeing. This is especially in view of persistently rising energy costs across Australia (Chester 2015). Point (2) in particular presents significant barriers to CHPs carrying out efficiency upgrades. Of the 31,000 dwellings currently in the NSW community housing sector, only 8,000+ are owned by CHPs, with the remaining 22,000+ tenancies managed by CHPs on behalf of the state government or private investors such as through the National Rental Affordability Scheme. Without ownership, CHPs are often precluded from carrying out significant upgrades, and coordination is required between state governments and CHPs to arrange for permissions and funding. This issue is likely to exacerbate, with the NSW community housing sector to be expanded through successive waves of management transfers from the NSW State Government under the NSW Social Housing Management Transfer Program, injecting another 18,000 tenancies into the sector, and CHPs unable to borrow against such assets on typically short (3-5 years) rolling leases. With plans to expand programs like HEAP to include other forms of social housing, it is essential to assess the barriers that these other housing providers (public housing and Aboriginal housing) face – which may or may not be different to those experienced by CHPs – in order to devise the most appropriate models of support. Likewise, while it is commonly accepted that social housing stock may be less energy efficient than ones that are owner-occupied (Point (7)), there is little evidence to highlight the extent of this inefficiency. Appropriate levels of assessment are, therefore, needed in order to assist social housing providers in considering the full extent of upgrades and support required (Santamouris and Kolokotsa 2015; Santamouris et al. 2017). Thus, establishing how to optimise deployment of energy efficiency technologies in social housing is a priority and one that can yield promising results both economically and in terms of energy consumption (Bahaj and James 2006). The project team will take a mixed method approach to establishing an evidence base for policymakers to devise appropriate solutions, especially in overcoming barriers that social housing providers face in performing upgrades to their properties. It will comprise an international literature review, 25 interviews with senior management of social housing providers of various sizes and locations in NSW (approximately 20% of social housing providers in NSW), a housing quality questionnaire, development of a spot measurement protocol for data collection at 100 dwellings for simulation, and a qualitative assessment of improvement outcomes.